Biotopes were identified through analysis of similarities and differences in the species composition between samples (200 m long video sections of video extracted from transects spread across the study area). In order to study these we make use of multivariate statistics - Detrended Correspondence Analysis is used to quantify species composition and k-means clustering is used to aid the identification biotope classes. Through these methods each sample is assigned the most appropriate biotope class and these can then be related to the physical environment (including terrain variables and sediments) after remapping the biotope classified points into geographic space (Figure 1). These important physical variables are later used to model the distribution of biotopes. Seven different biotopes were identified within the study area. Their characteristics, based on seabed video observations, are summarised in Table 1. Table 1: Summary of biotope characteristics based on seabed video observations. Average depth refers to the average depth for all samples belonging to a particular biotope class. 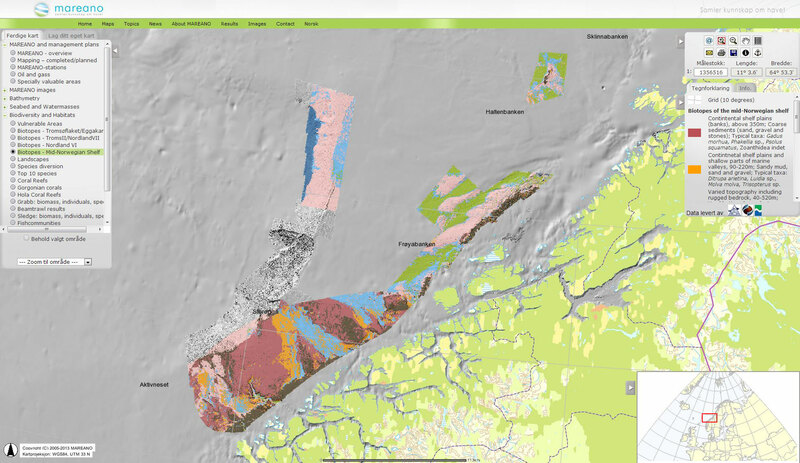 Landscape and terrain are described from bathymetry data. Dominant sediment from video observations. Biotope 7 145 59-350 Sand, gravel and stones. Continental shelf plains (banks). Gadus morhua, Phakellia sp., Psolus squamatus, Zoanthidea indet Hard bottom dwelling fauna. Biotop 6 168 90-217 Sandy mud, sand and gravel. Continental shelf plains and shallow parts of marine valleys. Ditrupa arietina, Luidia sp., Molva molva, Trisopterus sp. Mixed bottom dwelling fauna. Biotop 1 151 38-516 Gravel, stones and bedrock. Varied topography including rugged bedrock. Antho dichotoma, Axinella infundibuliformis, Phakellia sp., Porifera skorpe, Stylasteridae Hard bottom sponge communities (dominated by leaf-shaped sponges). Biotop 2 258 121-670 Mud, sandy mud, sand Marine valleys. Flabellum macandrewi, Pachycerianthus multiplicatus Sandy Hexacoral bottom. Biotop 4 293 181-456 Mud, sandy mud, sand Shallow and wide marine valleys. Funiculina quadrangularis, Kophobelemnon stelliferum, Stylocordyla borealis, Thenea abyssorum, Asteronyx loveni Seapen meadows. Biotop 3 308 109-670 Muddy sand, sand, gravel, stony coral (Lophelia) Ridges and slopes. Primnoa resedaformis, Cidaris cidaris, Bonellidae, Plakortis, Paragorgia arborea Stony and horny corals, urchins, echiuran worms, sponges. Biotop 5 988 644-1463 Sandy mud, gravel and compacted sediments. Lower continental slope. Gersemia rubiformis, Gorgonocephalus sp., Bythocaris sp., Cerianthus vogti, Drifa glomerata Deep sea fauna. All the biotopes, with the exception of number 5 occur with the depth range of Atlantic water. Biotopes 7, 6 and 1 are closely linked to the different types of sediments occurring on the banks. Biotopes 2 and 4 typically occur in marine valleys which transect the continental shelf. Biotope 2 is characterised by coral reefs and coral forests on various bottom types, often with ridges of various geologic origin. Biotope 5 represents the deepest parts of the study area and is dominated by deep sea fauna in cold Norwegian Sea water. In order to predict the distribution of biotopes across the entire study area these point observations of classified biotopes need to be related to full coverage data that can be used as predictor variables. Models were made for each biotope class individually using Maximum entropy modeling (MAXENT) and these were combined to a composite map (Figure 2). The predictor variables used in this final model were bathymetry, sediment grain size, landscape, local scale rugosity and orientation. 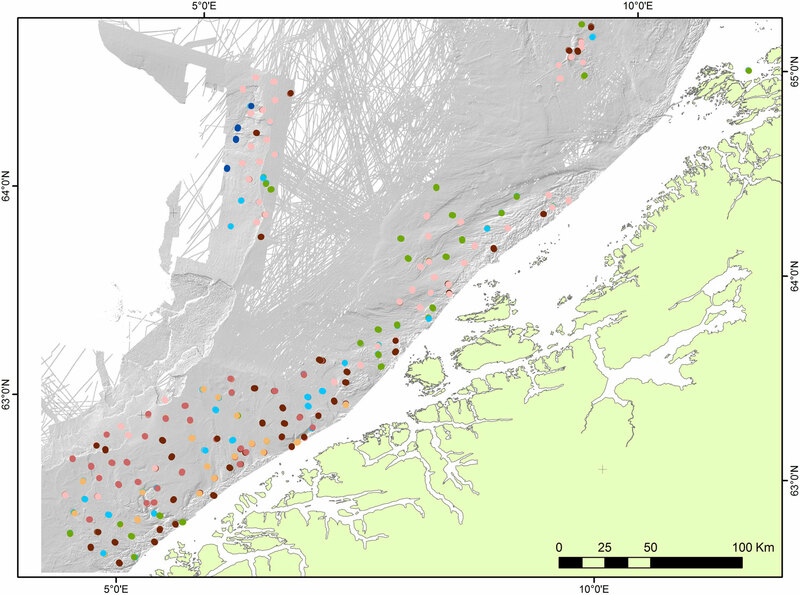 Figure 2.: Predicted spatial distribution of biotopes from modelling in the studied area of the Norwegian Sea. See Table 1 for colour legend and details on the physical and biological characteristics of each biotope. The predicted biotope map was evaluated using standard techniques and indicates that model performance varies across biotope classes, but that overall accuracy of the map is around 68%. Further testing of the model performance has also been conducted using the Kappa Statistic, a standard tool for assessment of classification accuracy. In Table 2 the user’s and the producer’s accuracy are given for each class, showing how the model performance varies across classes, and performance is summarized by the Kappa statistic (K) which indicates the predicted biotopes are moderately good (0.4 , K ≤ 0.6 moderate, 0.6 , K ≤ 0.8 good). Table 2: Modelling performance summary. Overall accuracy 68%. Kappa Statistic = 0.59 (moderately good performance). AUC (training) values give an indication of the performance of the individual model for each class with a value closer to 1 indicating a better model.